Kelly was the driving force behind the repeal of the so-called Wright Amendment, named after Ft. Worth congressman Jim Wright. When Dallas/Ft. Worth International Airport (DFW) opened in 1974, all airlines serving DAL as well Ft. Worth Meacham Airport moved across town to larger DFW. Southwest stayed put at Love and continued flying their routes within Texas. In 1979 the airline launched service to New Orleans, it’s first destination outside of Texas. In an effort to support the large investment in DFW made by the cities of Dallas and Ft. Worth -not to mention major airlines like Braniff International and American- as well as to presumably stifle unwanted competition, congressman Wright authored an amendment to the International Air Transport Act of 1979 that severely restricted air service at DAL. The amendment, which was signed into law in 1980, restricted scheduled passenger service using aircraft with more than 56 seats to cities in Texas and four bordering states: Louisiana, Arkansas, Oklahoma, and New Mexico. Furthermore, airlines could not sell tickets from DAL to destinations beyond those states, so a passenger wanting to fly from Chicago to DAL would have to buy two separate tickets to complete their trip. Although the new law didn’t immediately impact Southwest, it would become a thorn in the side of the carrier as it grew over the next two decades. The Wright Amendment was subsequently revised twice by Congress, once in 1997 to add Alabama, Mississippi and Kansas and again in 2005 to add Missouri. In late 2004, newly appointed Southwest CEO Kelly formally called for a repeal of the law, an announcement which was not surprisingly met with some strong opposition at DFW and American Airlines. Both thought opening up DAL to unlimited flights would cause damage to American which was still ailing from 9/11 and the ensuing recession, as well as divert passenger traffic away from DFW as a whole. In 2006 after a year and half of negotiation, a compromise was reached between Southwest, American and the cities of Dallas and Ft. Worth to sunset the Wright Amendment. Airlines would be allowed to fly non-stop to any US city from DAL. 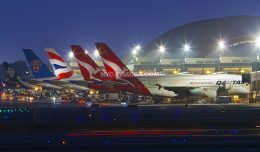 However a maximum of 20 gates would be allowed at the airport and international flights were off limits. The repeal would come eight years to the day the law was signed by President George W. Bush on October 13, 2006. In the meantime airlines could sell tickets to DAL from any US city provided they made a stop in one of the approved states. A new 20 gate terminal would also be built for when the repeal took effect, and the airport would receive upgraded baggage claim and parking facilities as well as new concession areas. 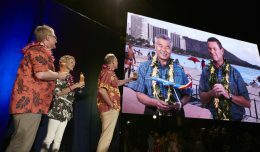 Southwest kicked off non-stop service to seven new destinations: Denver, Chicago Midway, Baltimore, Washington Reagan National, Las Vegas, Los Angeles and Orlando. In November the airline will add non-stops to Phoenix, Orange County, San Diego, Tampa, Ft. Lauderdale, New York LaGuardia, Atlanta and Nashville followed by service to San Francisco and Oakland in January. 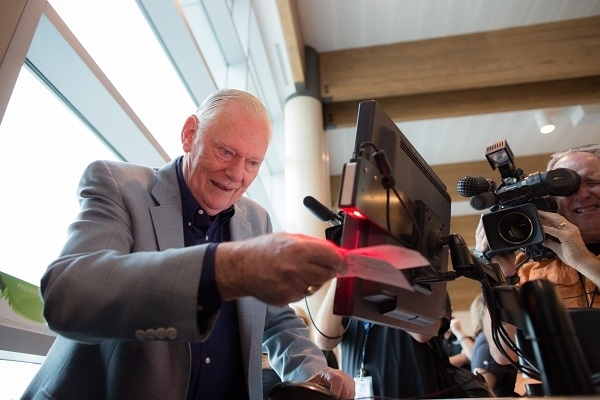 The first flights departed with much fanfare as Kelly, Southwest President Emeritus Colleen Barrett and founder Herb Kelleher were on hand to greet passengers. 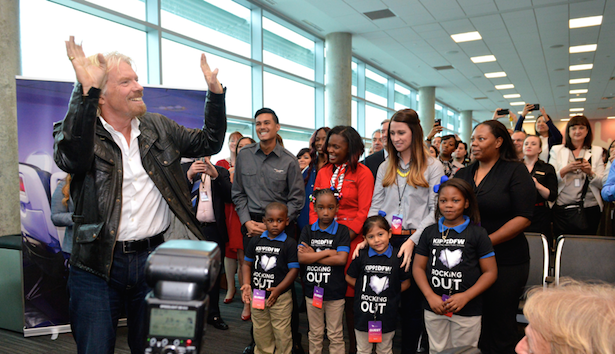 Passengers on each of the first departures to one of the seven new nonstop destinations also received gifts including shirts and Southwest Vacations packages and will be presenting passengers with various gifts and giveaways throughout the course of the week. 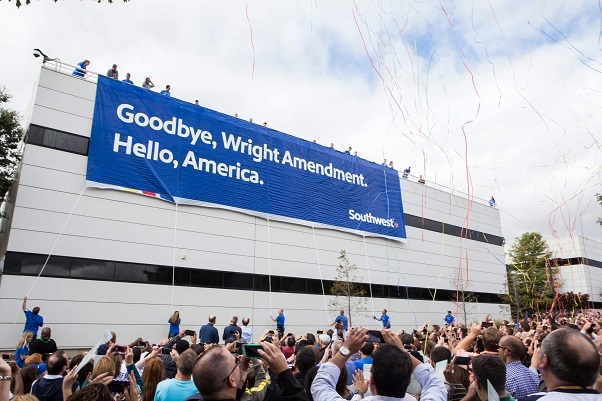 The celebration wasn’t limited to just Love Field as Southwest later held an employee rally and news conference at the company’s headquarters and employees throughout the city of Dallas gave away 1,000 free flights. Virgin America arrived with style at DAL (Virgin America). “Downtown Express” as the aircraft that operated Virgin’s last flight at DFW was ferried over to DAL. 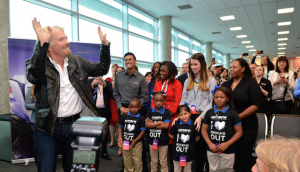 It was a party in the sky, as Sir Richard Branson along with contest winners, employees, media, corporate partners and even country music star Kacey Musgraves went along for the ride with Musgraves playing an acoustic set for inflight entertainment. The party continued later that night as the airline hosted the Lovefest Launch Party at the House of Blues. When the subject of the Wright Amendment repeal first surfaced a decade ago, many feared opening up Love Field to nationwide non-stops would hurt DFW and the airlines operating there. While Gary Kelly has stated that he expects traffic at DAL to increase 50 percent with the new nonstops and connecting passengers, executives at DFW and its largest airline, American, aren’t fazed. “Will it have an impact? 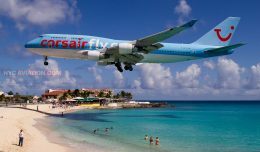 Sure, it’ll have an impact,” said DFW Airport chief executive Sean Donohue. “Do I think it’ll be a big impact? No.” American Airlines Senior Vice President of Marketing and Planning Andrew Nocella also believes the added crosstown competition won’t be untenable, “Net-net, we’re not going to say that’s not a financial hit to the company,” he said. “But at this point, I just don’t believe it’s material.” Executives at American as well as industry analysts believe that DFW’s sheer size and American’s large route network will continue to dominate the Dallas market as a whole. 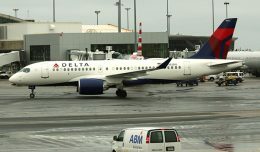 While the lifting of the Wright Amendment may drive a portion of local passengers to DAL, American can replace those enplanements with connecting passengers. Dallas will likely be able to sustain unrestricted air service at two hub airports so despite years of misgivings it appears Love and DFW-as well as American and Southwest- can coexist. And after all these years we can all finally say that a little bit of Love goes a long way. 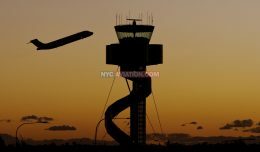 Gabe Andino is an Associate Editor for NYCAviation.com, aviation enthusiast and airport management professional residing in New Jersey. Follow him on Twitter @OGAndino.